St Dominic who died in 1221 aged about 49 was born in Old Castile. He joined the Augustinian Canons and became sub prior. While journeying in southern France, Dominic came across the Albigenses who followed the heretical teachings of the Cathari. He began a mission to the Albigenses in the region of Toulouse where he adopted a new style of evangelization as an itinerant mendicant preacher and founded a community, the Order of Preachers. His mission was not successful and, according to legend, in the year 1241 he retired to a cave in the woods near Toulouse. After three days of fasting and prayer, the Blessed Virgin appeared to him accompanied by three queens and fifty maidens, the number clearly corresponding to the pattern of the psalter. She raised him up and kissed him, and in the style of mediaeval mystical eroticism quenched his thirst with milk from her chaste breast. She then told him that not intellectual thundering against heresy but a gentle remedy against sickness was required. "Therefore if you will preach successfully, preach my psalter." The blessed Virgin then vanished together with her entourage. Restored and armed with the rosary Dominic went forth and reconverted the Albigenses to Catholicism. The Cathars who did not believe that Christ was a real man, born of a real woman, such as he, Dominic, had now experienced her to be, were to be persuaded by the statement proclaiming: "And blessed is the fruit of thy womb". The belief that it was through Dominic that the Blessed Virgin Mary gave us the devotion of the Holy Rosary, was the firm and constant tradition of the Church supported by a weight of authority which could hardly be called into question without temerity. But this view was challenged by Fr Thomas Esser writing in the 1890s. Fr Herbert Thurston reviewed the evidence very fully at the beginning of the last century and came to the conclusion that there is a complete absence of St Dominic's name in connection with this devotion until 250 years after his death; there is no mention in biography, recorded sermons, in the documents for the process of canonization, nor in paintings or sculpture. None of the many early Dominican saints used the rosary as such though many of them did recite a multitude of Aves. For instance Blessed Benventuro Bojani said 1000 Aves daily and 2000 on Saturdays. The link between the rosary and St Dominic would seem to have been proposed by Alain de la Roche, a Dominican Friar and founder of the first Rosary Confraternity in 1468. What is certain is that from that time onwards the Dominican Order of Preachers were the main promoters of the Marian Rosary. If it was not St Dominic who gave us the Rosary where did it originate? My reading of the story of the Rosary will show that there was no one point of origin, rather it evolved over a long period and from a variety of sources. The multiplicity of streams of development and other influences are depicted in the Illustration. If we were to compare it to a river system, there are four main rivers or lines of development. Three have their source in Scripture, the Psalms, the Our Father and the Hail Mary, and finally the use of prayer beads. The Psalms and Jewish liturgical tradition flow into the Divine Office of monastic practice out of which come the Marian Psalm Psalters and the Paternoster Beads. The monastic custom of reciting prayers and, in particular, the psalms at certain fixed hours of the day has its origins in Jewish practice. Ps 88:13 But I, O Lord, cry to thee; in the morning my prayer comes before thee. Ps 119:164 Seven times a day I praise thee for thy righteous ordinances. The first Christians preserved the custom of going to the Temple or synagogue at the hour of prayer and observed the Jewish custom of praying at midnight, the third, sixth and ninth hour cf. Acts. The Eucharistic Meetings took place in private houses usually in the evening and often continued to dawn. When such vigils became separated from the Eucharist this liturgy divided naturally into three parts; evening prayer; the vigils properly so called; and the end of the vigils or morning prayer. Thus we have the beginning of Vespers, Matins and Lauds. During the day, prayer at the third, sixth and ninth hours became Terce, Sext, and None. Compline, a repetition of Vespers, and Prime were added in the fourth century. So by the 5th century the order of the Divine Office was established. We now use revised Liturgy of the Hours published by Paul VI in 1970 in which the Psalter is covered in a four week cycle. Matthew’s version was adopted for liturgical purposes quite early on and was incorporated in the celebration of the Eucharist and the Divine Office. Repetition of the Pater noster most certainly preceded the repetitive use of the Ave Maria. The general understanding is that at some stage 150 Paternosters were substituted for the 150 psalms of the Divine Office. The practice of praying fifty Our Fathers for the deceased was prescribed for the lay brothers as early as 800 in the Benedictine monasteries of St Gall and Reichenau. The ‘Ancient Customs of Cluny’ of 1096 record that when the death of one of the brothers was announced, each priest was to offer Mass and the lay brothers to say fifty Psalms or repeat fifty times the Paternoster. For the recitation of the psalms it was necessary that a book be available and that the monks could read. Candidates for brotherhood would be of humble birth and hence illiterate. Most spent their lives working on the grange as farmers and herdsmen. Except for Sundays and holydays they were not present at the Divine Office, but under the direction of the senior member of the group, recited a certain number of Pater nosters at the time of the canonical hours wherever they happened to be working. The practice of reciting a string of Paternosters became very popular with the laity. The number of prayers was counted on a knotted string or string of beads, known as Paternoster Cords or Beads and hung from the belt when not in use. The makers of paternoster beads tended to group together hence we have Paternoster Lane in London. A further development that came out of the monastic use of the Psalter in the twelfth century was the “Ave Psalm Psalter” made up of 150 rhymed, four line stanzas, each beginning with the word Ave, addressed to the Blessed Virgin, each paraphrasing a theme from the Psalm to which it corresponds. Jesus Christus in gloria Jesus Christ in glory. In her book The Story of the Rose, Anne Winston-Allen shows how the German vernacular Marian Psalters of the 13th century each verse of which begins with the salutation Ave Maria and a verbal “rose”, that is, a Marian symbol or title of honour followed by a petition, e.g. A psalter from the early 14th century refers to itself as a "rôzenkranze" or rosary. Instead of beginning with the Latin ‘Ave Maria’ it begins with the German equivalent - “I greet you” and praises the Virgin for her purity, piety and beauty. the chosen, the pure, the tender one. entreat God for me through your goodness. In another Marian Psalter dated from early 14th century there is for the first time a series of scenes from the life of Christ inserted into a traditional litany of praise to the Virgin. The first two sets of fifty stanzas list the attributes of the Virgin. The third set of fifty recount events in the life of Christ. that we may find a just end. Anne Winston-Allen’s aim was to show how the life-of-Christ narrative first grew out of the Marian Psalm Psalter and later became attached to the rosary. We find the origin of the first part of the Hail Mary in the Gospel of St Luke. It is a combination of the first words of Gabriel to the virgin Mary, Lk 1:28 and the response of Elizabeth to Mary’s visit. Whereas Elizabeth greets her cousin Mary with a ‘blessing’. Hail Mary, full of grace, the Lord is with thee, blessed art thou amongst women, and blessed is the fruit of thy womb, because you have conceived Christ, the Son of God, redeemer of our souls. In Western Liturgy, in about 600, a similar prayer formula is found as an Offertory antiphon for the feast of the Annunciation. There is little or no trace of the Hail Mary as a popular devotional formula before 1050. All the evidence suggests that the Angelic salutation and the greeting of Elizabeth as a prayer became popular through the recitation of the Little Office of Our Lady in which the Ave Maria is frequently used as a versicle. The Little Office appears first as a private devotion in the 10th century then as an addition to the Divine Office amongst the monastic orders in the 11th century. By the 12th century the daily recital of the Little Office of the Blessed Virgin was a popular devotion in general use. It was Thurston’s opinion that the words of the angel Gabriel, having become familiar through the Little Office, came, in the course of the 11th century, to be used by pious persons as an independent prayer of salutation to the Blessed Virgin and that this custom spread widely amongst all classes in the following century. The Marian legends of the twelfth century tell of pious individuals being rewarded by the Blessed Virgin for the practice of reciting strings of Aves. It was believed that hearing these words brought Mary delight by recalling to her the joy of the Incarnation. One legend of the late 13th century describes the reciting of chains of Aves as the act of creating a symbolic wreath for the Virgin. In this tale, fifty Aves chanted by a monk miraculously turn into roses as they come from his mouth and form a garland or “rosen crantz.” Originally, the term rosarium had been used to designate a garden, an anthology of texts, or a rose garland. Ultimately, it came to refer to fifty salutations to the Virgin. For keeping track of these prayers, chains of beads came into use. In Germany, the beads are called a ‘zapel’ or chaplet from about 1220. The beads were also known as Ave or Paternoster beads from the practice of counting repetitions of Aves or Paternosters. It is important to stress that those who first used this formula recognized that the Ave Maria was essentially a form of greeting. It was therefore customary to accompany the words with some gesture of homage, a genuflection, or at least an inclination of the head. Fr Thurston writing in 1916 draws our attention to the practice of multiple genuflexions which existed in the East from the fourth century and continues to the present day. As a form of asceticism it was adopted with special ardour in Ireland. From these two extremities of the Continent, the practice had spread throughout the greater part of Europe by the year 1200. These genuflexions were performed in fifties, or multiples thereof and were frequently accompanied by the repetition of a short prayer. This practice was given as a penance, and is found in the Penitential books where the tariff for commutation of canonical penance might be, for example, 700 genuflections, and seven blows with a scourge, and a crossfigil ( holding the arms extended) at the end of every hundred until the arms are tired, in place of a week of strict penance on bread and water. To compensate for one day’s penance on bread and water, a man should recite 50 psalms in church with genuflections, or for a month of fasting - 1200 psalms with genuflections. When we speak of a ‘genuflection’ today we think of going down on one knee but in the present context I think we should understand the act of ‘genuflection’ or ‘prostration’ as going down on both knees, bowing so as to touch the ground with the forehead. [The literature is not clear on this and a single genuflection may have been used ]. The double genuflection is known in the Orthodox church as a great metany (metanœa), referred to in Latin as a veniae (a pardon) and to the Irish monks as the slectain. Those who practised this form of asceticism on a regular basis developed hard callouses on the knees and bumps on the forehead. Of St. Aybert, (before 1140) it is recorded that he recited 150 Aves daily, 100 with genuflexions and 50 with prostrations. Of St Louis of France (1214-70) that “without counting his other prayers the holy King knelt down each evening fifty times and each time he stood upright repeated slowly an Ave Maria”. Just how they kept count of such large numbers of prayers we do not know but some device such as a string or circlet of beads would have been helpful. Fr Thurston’s thesis is that during the 12th century the Ave i.e. the Angelic salutation alone, was the adjunct of the genuflexion, rather than the genuflexion the adjunct of the Ave. The sacred name “Jesus” is thought to have been added by Pope Urban IV in 1261 and was granted an indulgence by Pope John XXII (d. 1334). To bow the head at the name of Jesus, was commanded by Gregory X on 12 Oct. 1274. The final part of the prayer, the invocation to Mary, may have been influenced by the Litanies of the Saints, introduced towards the end of the seventh century with the invocation to Mary, Sancta Maria, ora pro nobis. Such a petition is found in a hymn recorded in the Analecta Hymnica in the 12th century . and at the world’s judgement. The official recognition of the Ave Maria in its complete form was finally given by inclusion in the Roman Breviary authorized by Pius V in 1568. Fr Thurston observes that in some places, and notably in Ireland, the feeling survived during the 19th century that the Hail Mary is complete with the word ‘Jesus’. Indeed it was said that it was not uncommon for Irish peasants, when bidden to say Hail Marys for a penance, to ask whether they were required to say the ‘Holy Marys’ too. The use of various devices for counting prayers must have arisen in most cultures from the earliest times, our ten fingers being the obvious and most primitive. Prayer beads as such, on which the sum of prayers is worked out, are not a discovery or invention that can be attributed to a single source. The earliest reference to a string of prayer beads I have come across is associated with the cult of Shiva, in India, in the pre Aryan period, that is before 1700 BC. The oldest reference to prayer beads to be found in the literature of India is in the Jaina canon in 4th cedntury BC as a device used by Brahman monks. It may be that from India the use of prayer beads spread, northward through Tibet to China and eventually to Japan with the spread of Buddhism, and simultaneously westward through Persia to Arabia, on to Egypt and so to Europe. However it is much more likely that such a simple device as a knotted string or a string of beads evolved amongst any group that required a means of counting. The recitation of multiple prayers would also seem to be widespread. The use of repetitive prayer in the Christian Church seems to have evolved among the desert monks and for this purpose various means of counting were used. The story is told how abbot Paul, a hermit of Thebes in Egypt who died in 347 AD, daily recited 300 prayers, keeping count by means of pebbles gathered in his cloak, dropping them one by one at the end of each prayer. This primitive system of counting suggests that the rosary evolved independently and was not taken over from others. The development of the komvoschinion or Byzantine rosary - a circular string of knotted wool is attributed to St Anthony of Egypt (251-356), a disciple of Paul of Thebes, and founder of organised monasticism. John Cassian (c.360-430) studied monasticism in Egypt. In about 415 he founded two monasteries near Marseilles and it is from him that we learn of the Eastern method of repetitive meditative prayer. Perhaps he also introduced the eastern prayer rope but there is no evidence to support that idea. During the next seven hundred years we have only a few hints that suggest the use of repetitive prayer and the beads. As already mentioned the lay brothers in the monasteries of St Gall and Reichenau in c. 800 had the practice of praying fifty Our Fathers for the deceased as did the monks of Cluny from 910. Which prayers were used is not known. Lady Godiva died before 1070. During the twelfth century it became a common practice for lay people to carry a ‘Paternoster cord’ of fifty knots or beads, a ‘fifty’ to be repeated three times instead of the traditional longer strand of a hundred and fifty. The Development of the Rosary as we know it. From the four original sources, the psalms, the Our Father, the Hail Mary and Prayer Beads we have come down to two main streams - the Marian psalm psalters and the Ave chaplets. Now I want to show how during the 15th century these two streams of Marian devotion come together when another Dominic, a Carthusian monk joined meditation on the life of Christ with the repetition of the Ave Maria in sets of 50 prayers sometime between 1409 and 1415. 19th Jesus Christ whose feet Mary Magdalen washed with her tears, and wiped with her hair, kissed and anointed. Amen. Dominic made it clear in a supplementary note that this scheme was to be taken only as a suggestion. In practice there was much experimentation and many variations were in use. The three Carthusians, Adolf of Essen, Dominic of Prussia and Johannes Rode, the Prior, personally spread this devotion. But by far the greatest means of propagating this devotion was by correspondence. It is claimed that Dominic and his brother monks distributed more than a thousand copies of this prayer exercise. The addition of life-of-Christ meditations changed the nature of the devotion. Emphasis on the person of Jesus and the events of his life, in effect, transformed the Ave Maria prayer into a Jesus prayer, a shift that reflects the popular impulse toward imitatio Christi piety. Instead of simple Aves, repeated ritualistically because the Virgin liked to hear them, or Psalms recited round the clock in order, literally, to pray without ceasing, imitatio exercises had as their goal the conforming of the individual worshiper to the model of Christ. This shift from an outward to an inward focus was directed toward transforming the person. Dominic attributes his inspiration to a passage in Mechthild of Hackeborn’s (1241-99) Book of Spiritual Grace where Mechthild records a vision of a beautiful tree upon whose leaves were written in golden letters the entire life of Christ. the Coronation was combined with the Assumption and the Last Judgement was the fifteenth mystery. The Dominican, Alberto di Castello, in 1521, in his book The Rosary of The Glorious Virgin, tried to unite the old and the new forms of the mysteries. A mystery was attached to each Pater and the fifty meditation points were attached to the Ave. It was during the 16th century that the rosary of fifteen mysteries became the accepted form. Alberto was the first to use the term ‘mystery’ in this context. It was a Dominican, Alain de La Roche (c.1428-75) influenced by the Carthusians of Trier who did so much to promote the rosary in the late 15th century. Alain was a Breton, a learned and eloquent man, a teacher of theology, a Dominican Friar of the monastery of Dinan. In c. 1460 he believed that he had been commissioned by our Blessed Lady in a vision to preach the rosary devotion and to found rosary confraternities. He was prone to visions and ecstasies and was considered by some to be a “really frantic and crazy man”. He is sometimes given the title ‘Blessed’ though he was never beatified. Alain founded his first Confraternity - "The Confraternity of the Psalter of the Glorious Virgin Mary" at Douai between 1468-70. His aim was that the organization should be easy to join without vows or constraints, and moreover it was free. There were no penalties for failing to say the prayers, no prescribed times for saying them and no prescribed manner - the rosary could be said standing or walking. It was such flexibility that was partly responsible for the success of the confraternities. Alain died at Zunolle in Flanders on 8 Sept 1475, the very day another and more influential Confraternity was founded by Jakob Sprenger in Cologne. This had the support of Frederick III whose name appeared among the earliest members on the Cologne register. The Emperor leant credibility and prestige to the organization leading to approval by the Papal Legate, Alexander of Forli in 1476. The brotherhood spread quickly to other cities, not only in Germany but also Lille, Ghent 1475, Lisbon 1478, Venice 1480, Florence 1481, and Barcelona 1488. Each chapter of the brotherhood was independent, any location could start one. It was only required that members should sign a membership roll with their name, marital status and whether they were religious or lay persons. Membership was predominantly but not exclusively female. As a social phenomenon, the brotherhood was attractive because of its lack of discrimination. Sprenger declared membership open to everyone so that the poor, and the needy, and the languishing “of this knavish world” could become the equals of the rich. Extra-liturgical religious practice and private devotion flourished in the late Middle Ages because the laity felt they were but spectators at the Eucharist. We can see how easy it was for the practice of reciting the Rosary during Mass to develop. It is recorded that St Francis de Sales 1567-1622, Bp. Geneva, took his rosary to Mass so a not to waste good praying time. Alain favoured the traditional Marian psalter of 150 Aves. The Book and Ordinance of the new Confraternity recommended dividing the 150 Aves into three sections of fifty to be recited morning, noon and evening. First the prophecies of Jesus, then His childhood, and finally the Passion. It also suggested marking off the Aves with 15 Paternosters thus the number of Paternosters recited in the course of a year would equal the number of wounds Christ suffered as reckoned by St Bernard, that is, 5475. Alain recommended the recitation of the prayers before a picture as an aid to meditation. A picture of Mary and her Child, greeting in Mary, the eyes that saw Jesus, the ears that listened to his voice, the lips that kissed him, or alternatively a beautiful picture of Christ, reciting an Ave, to the hair that was torn, to the crown of thorns, to the wounded brow, to the weeping eyes, and so on, and finally to salute the perfection of God and the saints in heaven. 1 Michael Francisci, a professor at Cologne University, presented a series of lectures in December 1475 defending the devotion of the Confraternities against their detractors. He interpreted Alain's ideas to a wider public in a form that was attractive and practical. 1) Mary's earthly joys, 2) her Passion sorrows, and 3) her heavenly joys. Jakob Sprenger recommended in his statutes of 1477 that the members of the brotherhood say three rosaries a week, each consisting of 50 Aves with five Paternosters. He spoke of ten white roses and the insertion of a red rose with which there should be meditation on the rose red blood of Christ but does not specify any meditation on the white roses. Promotional writings for the new confraternity founded by Alain marketed the devotion as a way to reduce time in purgatory and as a talisman to protect users against all manner of evil in this present life. The statutes of the Douai brotherhood advertised very generous but inauthentic indulgences of up to 30,000 years for saying the prayer. The first of many rosary indulgences was granted to the Cologne confraternity in 1476 by the papal Legate. Pope Sixtus IV in a bull promulgated in 1478 granted an indulgence of seven years and seven quarantines - 40 days. He also extended indulgences so that they might be applied to souls in purgatory and it was this faculty that, in part at least, accounts for the popularity and rapid spread of the rosary confraternities among a population who were concerned about this matter and as an insurance that they too would benefit after death from the prayers of the brotherhood. By 1520 the amassing of all kinds of indulgences, as insurance against purgatory, reached monumental proportions. John Eck criticised the Holy Ghost Order for having acquired for its members a million years and forty-two plenary indulgences. Martin Luther challenged his academic colleagues to debate the subject of indulgences and he challenged the interpretation of indulgences as preached by the Dominican, Johann Tetzel. No one took up the challenge. Luther wrote his ninety-five theses and sent them to the Bishop who had licensed Tetzel but got no response. Only then did he post them on the door of the Church in Wittenberg on 31 Oct 1517. It was not until 1567 that Pius V acted to prohibit the abuses. During the 16th century the rosary became firmly established and recognised. Pope Leo X gave the rosary official recognition in 1520. It continued to be propagated by the establishment of rosary confraternities which were increasingly under Dominican control. In 1559 Pius V gave the Dominican Master General exclusive control over the rosary confraternities. At the Dominican General Chapter of 1574 there was great concern because other Orders such as the Franciscans were showing paintings of the Blessed Virgin giving rosaries to their founder Saints and took steps to counter this trend. Their control was such that until 1984 the blessing of rosaries was reserved to Dominicans or priests having special faculties. The name of the Feast was changed by Gregory XIII to the Feast of Our Lady of the Rosary and transferred to the first Sunday of October in 1573. Since the 1969 revision of the calendar it has reverted to the 7 October. The Glory be to the Father and the Apostles Creed were added to the rosary prayer during the 17th century. The overall configuration and prayer sequence of the rosary was becoming more and more uniform. It has been said that during the 17th century, the rosary became the Marian prayer par excellence, recited at births and wakes, in church and at home, virtually omnipresent within Catholicism. The first Pope to give the Rosary his support was Leo X in 1520 and it was officially approved in 1569 by Pius V. Subsequent Popes have continued to promote the Rosary as an important devotion. In modern times four Popes have given particular emphasis to the Rosary - Leo XIII, Pius XII, Paul VI and John Paul II. Pope Leo XIII (1878-1903) wrote a series of 12 encyclicals and five apostolic letters on the Rosary. Beginning in 1883 and concluding in 1898, an encyclical on the Rosary appeared almost every year, in preparation for the month of October. In his teaching Leo XIII established the Rosary as a public devotion. The first encyclical (1883) prescribed the public recitation of the Rosary and the Litany of Loreto in Catholic churches and chapels as a special observance for the month of October. The encyclicals of 1884 and 1885 directed that October devotions be continued. The feast of the Most Holy Rosary was given a higher liturgical standing and the invocation “Queen of the Holy Rosary” was added to the Litany of Loreto. From 1891 Leo XIII dwelt on the value of the Rosary and on its role within the life of the Church and of society. He made frequent reference to the perilous situation in which the Church found itself, with anticlerical governments and forces opposed to religion threatening its existence. He saw the Rosary as a “balm for the wounds of society” and believed it would influence society as a whole. Even when prayed privately, the Rosary has a social and ecclesial dimension, similar to the Divine Office. In all the encyclicals, the Rosary is not so much presented as a devotion directed to Mary but rather to Christ, in all the facets of His life - hidden, public, final suffering and resurrection . Leo XIII saw the Rosary as an instrument “to expand the kingdom of Christ.” - a prayer that has been “wonderfully developed at the close of the century, for the purpose of stimulating the lagging piety of the faithful” (1897). His legacy was the establishment of Rosary as a central devotion in western Catholicism. Following the Second Vatican Council there was a falling away in Marian devotion perhaps because the main focus of the Church and her energy was directed towards Liturgical renewal which enabled the faithful to participate more actively in the Churches official worship. In Part III the Pope considers the Angelus and the Rosary. Pope John Paul II whose dedication to the Blessed Virgin is well known has made a special point of promoting devotion to the Blessed Mother. Pope John Paul II has frequently recited the Rosary in public, on TV and Radio and one can gain a Plenary Indulgence by reciting it with him on those occasions. The form of the Rosary which is familiar to us today I designate the Dominican Rosary because it was promoted by the Dominicans, and to distinguish it from other forms. I want now to present three important and historically significant variants of the Marian Rosary. Historically the greatest rival in popularity to the Dominican Rosary was the so-called Bridgettine Rosary. Fr Thurston has investigated the origins of this chaplet. The chaplet called after St Bridget, because she first devised it and propagated it, is recited in honour of the most holy Virgin Mary, in order to commemorate the sixty-three years which, as it is said, she lived on this earth. It consists of six divisions, in each of which are said the Our Father, the Hail Mary ten times and the Apostles Creed once. After these six divisions another Our Father is added to make up the number of her seven dolours, or seven joys; and the Hail Mary is said three times to make up the number of her sixty-three years. In spite of this tradition and Papal authority there is no hard evidence to support the idea that it originated with St Bridget (d. 1373). 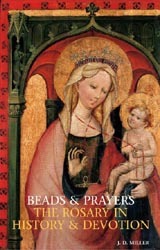 She may well have used a string of beads but there is no evidence that she or any of her followers invented a new method of praying the beads. The first documentary evidence is a decree of the Congregation of Indulgences issued in 1714 which quotes a brief of Pope Leo X from 1515 granting an Indulgence of one hundred days for each Ave to those reciting the Corona of St Bridget. There is no question that St. Bridget did assign the term of sixty three years for Our Lady’s life in her Revelations. It is therefore reasonable to postulate that the name of St Bridget became associated with the 63 Ave Corona to distinguish it from the Franciscan Corona of 72 Aves. The Bridgettine Rosary was almost as popular as the Rosary properly so-called in the 16th and 17th centuries. The little pendant of three small beads now almost universally attached to all rosaries, has been transferred, with a lack of any understanding of its significance, from the six decade corona (60+3) to the five decade chaplet, where no specific meaning can be assigned to them. This 15th Century devotion is recited like the Rosary. It consists of seven decades of Aves separated by a Pater and completed with the Gloria Patri, after which two Aves are added (making 72 Aves in all, the traditional years of Our Lady’s life as revealed in a vision to St James of the March) and a Pater, Ave and Gloria for the Pope’s intentions. Suppose Br. Leo we are suffering intensely from hunger and the painful cold. We knock on the door of a Franciscan Friary in Assisi. The porter fails to recognize us. He becomes so enraged that he takes a club, grasps us by the cowl, throws us to the ground, rolls us in the mud and beats us severely. If we endure all those evils and insults and blows with joy and patience - O Brother Leo that is perfect joy! The Chaplet of the Seven Sorrows of Our Lady originates with the Servites in the 14th century and was actively promoted by them during the Black Death plague of 1347-51. The Sorrows of Mary, standing under the cross of Christ, has had a prominent place in the spirituality of the Servite Order. There is no episode relating to Mary in the gospels which cannot be read in terms of the mystery of the passion of Mary’s Son. The sufferings of Christ define the Marian sorrows and give them their significance. During the 12th and 13th centuries, a growing awareness of the significance of the humanity of Jesus and his sufferings, led to an awareness of the human dimension of Mary’s sorrows. From the 14th century, when the number of the sorrows was established as seven. Eventually the seven sorrows as set out in the responsories of matins for the feast granted to the Servite Order in 1668 were accepted as the popular form of the devotion. In modern times this Chaplet has lost it’s general popularity but is kept alive in Servite devotions. Very recently it has received endorsement and encouragement in Kibeho, Rwanda where it is reported that the Blessed Virgin, the Mother of the Word has been appearing to a group of young people since 28 November 1981. On 27 March 1982 Marie-Claire Mukangango was instructed to inform the bishop that the Blessed Virgin wished Christians to recite the Chaplet of the Seven Sorrows, since the world is in revolt..... On 31 May 1982, Our Lady is reported to have said to Marie-Claire: “What I am asking of you (the world) is to repent. If you recite this Chaplet, duly meditating upon it, you will receive the strength to truly repent. This Chaplet is of recent origin and is now widely accepted and in current use. The Rosary is at once a simple prayer formula accessible to everyone and yet a very profound prayer requiring considerable diligence and application to say well. Likewise the history of the devotion is basically simple and yet it has many ramifications. The full history has yet to be written. It is a vast field and would require a knowledge of several languages and a great deal of time. I have culled my information from others who have done the research. The credit should go to them.